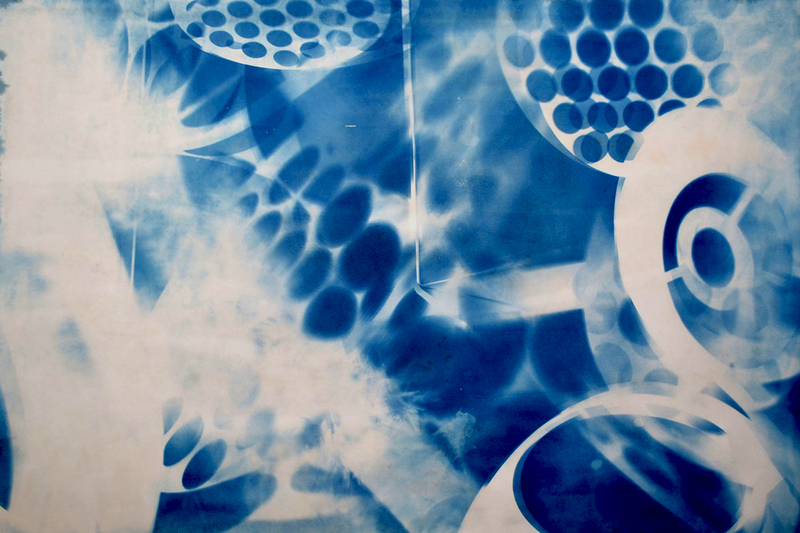 Inspired by a Superposition visit to see big science at DESY and a desire to refine the process of making cyanotypes using artificial UV light in December 2015 I undertook a live art making exhibition, Blueprints In Time, at The Grand Art Project, Leeds. Cyanotype is an early photographic printing process discovered by English Scientist Sir John Herschel in 1842. Although used by artists and photographers, most notably by Anna Atkins was also used by engineers and architects well into the 20th century to produce copies of drawings, referred to as blueprints. Using artificial UV light to make cyanotype prints/ monographs is a slow process and this allowed me to undertake three different experiments/ art making processes in the space. This build upon The Museum of History of Science Technology Medicine, Light Night 2015 activities. Cyanotypes are usually made using natural light, however, at light night we had used artifical UV light to make blueprints of Magic Lantern slides on paper and T-Shirts. While visitors were happy on light night I felt that the Magic Lantern slides in the HSTM collection are so beautiful I should try to perfect the printing process. Stop-motion films of chemical reactions made at DESY, Germany, inspire the second. I used an electromagnet , a UV bulb and home made stand to make monograms of the shadow of iron filings as they were held in place by magnetic fields at different strengths. The proof of concept worked and I plan to make a cyanotype stop-motion animation out of a magnetic field field expanding with power inputs of 0-12V. From salutations made during Blueprints In Time it will take a minimum of 80 hours to make the images for the film. The last experimented with reaction times and energy of the cyanotype chemicals. A mixture of natural light and artificial glass exposed home made photographic paper that sat underneath or behind sculptures and arrangements of laser cut MDF, clear acrylic and glass. Each was then developed and displayed in the gallery.